Monday was a cloudy and rainy day. At the Edwin B Forsythe National Wildlife Refuge a Great Egret was standing by himself, very dainty and haughty in full breeding plumage. 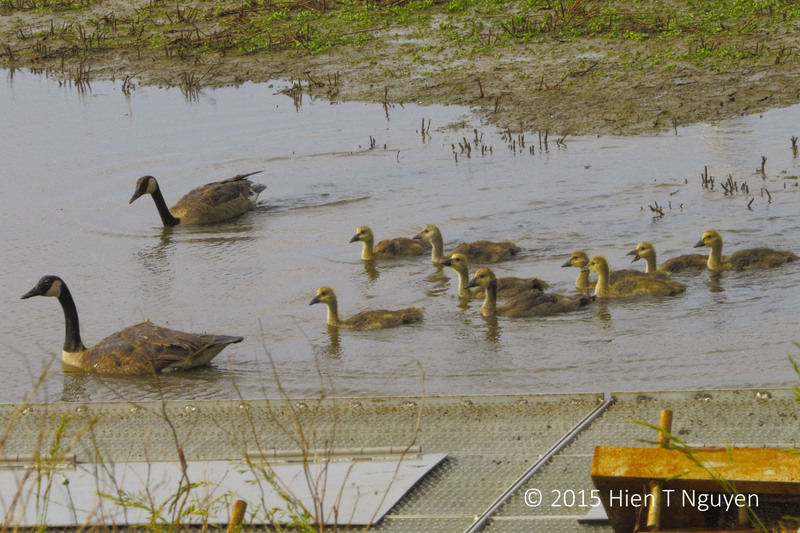 A family of Cannada Geese with nine goslings loved the weather and went in for a swim. Of course, the goslings thoroughly enjoyed the water. They are beautiful, but humorous too 🙂 Great captures! Egret: I wish I have a big family. 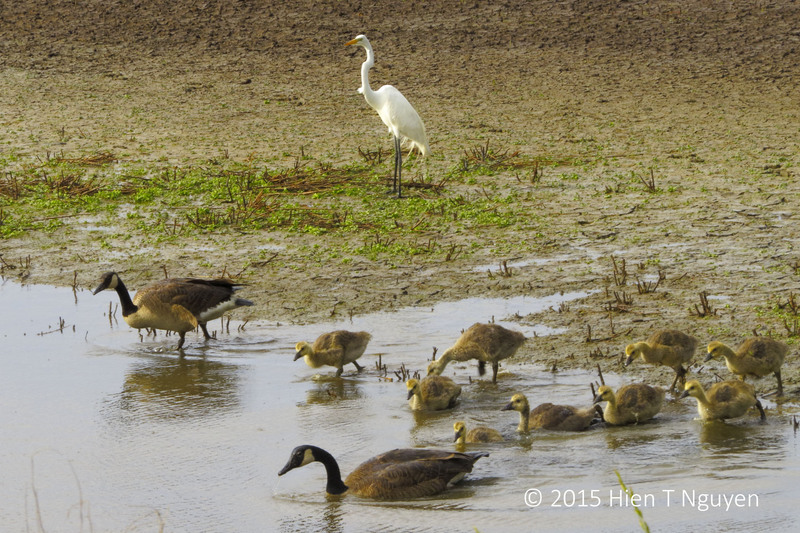 2nd Gosling: Mom, why can’t I be the only kid? That’s hilarious, Helen. Thank you for this great comment. Such a beautiful contrast of 2 birds. The great Egret looks very dignified and elegant. The Canada Geese (we can’t see them here in Japan) are also very beautiful, especially their black and brown colours. And the baby geese…so tender, and growing quickly! Thank you for sharing. Very keen observations, Takami! Thank you so much for commenting. It’s my pleasure! I sincerely look forward to your photos. 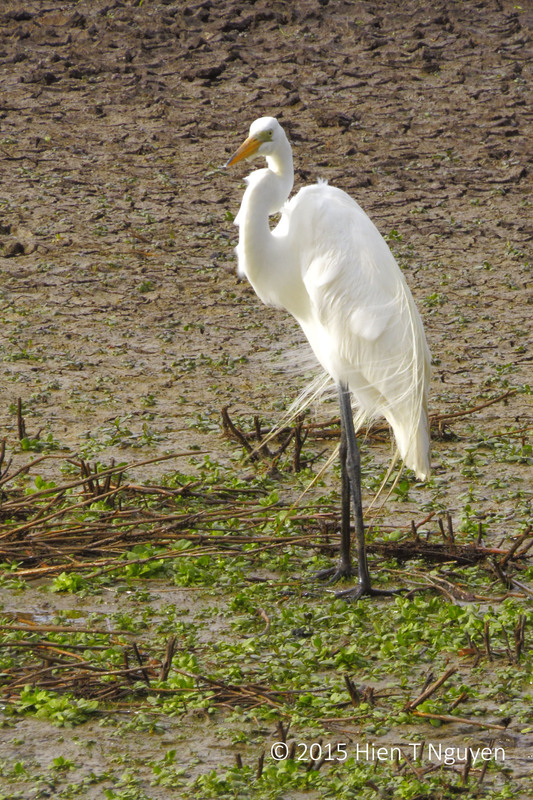 Indah, great egrets stand about 3ft or 1m tall, even when their necks are not fully extended. Glad you like the images, and thank you for commenting.